These are the people to take inspiration from. Previously, I wrote here  extensively about the nature of Russian identity and how it crucially differs from European identity in many ways. In the present article I will discuss why it is naïve and delusional to expect Russia to help white Europeans in their struggle and, moreover, why Russia should not in principle be looked upon for any kind of help or spiritual guidance. In contrast, I will argue that it is Ukraine, and more particularly the recent Ukrainian Revolution, that should serve as a guidance and inspiration for western White Nationalists and by extension to whites all around the world. Contrary to what many distant observers may think, Russian society suffers the same decadence that is characteristic of the liberal West. Indeed, one can even argue that the situation in Russia is far grimmer. For example, the disintegration of traditional family is being lamented in the West (and justifiably so). But the family has far more serious problems in Russia. For example, Russia has long had the highest divorce rate in the world. It may be partly attributed to economic problems. But this is still not an excuse. Many Third World countries are poorer than Russia. Nevertheless, they continue to preserve a firm, traditional family structure. Most importantly, according to a recent survey , cheating turned out to be the main factor behind divorce (24%), followed by poverty (21%) and inability to compromise (19%). Although poverty can be attributed to harsh economic conditions, the other two factors are clearly indicative of a deep crisis of values within modern Russian society. The ostensible attempts of the Putin government and the Orthodox Church to remedy the situation and reform Russian society in accordance with traditional values have had little, if any, success. Russian society — especially the youth — is fully in the grip of Western consumerism and decadence. Clearly, being patriotic and proud of one’s past does not in any way prevent one from succumbing to decadence. Sexual morals are as lax in Russian society as they are in the West, and Russian television is even more vulgar than in America. The majority of young Russians practice — or at least long for — a licentious lifestyle. Like Catholicism and Protestantism, Orthodox Christianity is not strong enough to counter modern decadence. The church’s apparent rise in power and importance in post-Soviet Russia is only superficial. As with being a Russian patriot, being devoutly Orthodox is apparently not enough to prevent decadence in a person’s private life. When the people look to the church and its leaders, they often see examples not of holiness but of flagrant corruption and hypocrisy. While the majority of the Russian population lives at the brink of poverty, many clerics, including Patriarch Kirill himself, are well-known for their opulence. Recently there was a controversy surrounding Patriarch Kirill after he was noticed wearing a Rolex watch. Many clerics are known to drive very expensive cars, live in sumptuous residences, and lead sybaritic lifestyles. Clearly, if they were concerned about uplifting social morals, they would be providing a better example. The recent “anti-gay laws” will have little effect, because in Russia, as in the West, the breakdown of marriage and family life is the fault of the heterosexual majority. Prohibiting homosexual propaganda in the schools will obviously not turn Russian heterosexuals into better husbands and wives, fathers and mothers. Moreover, in spite of its large oil and gas reserves, and in spite of not being governed by communism for more than 20 years now, Russia remains an essentially Third-World country with a weak economy and a crumbling infrastructure. In fact, it subsists only on its natural resources and nothing else. Many people live at the brink of poverty. Many towns, especially as one moves eastwards, still don’t have proper streets, electricity, and water supplies. Corruption, arbitrariness, and lack of humanity are rampant at all levels of administration. In the meantime, Putin and his entourage are only interested in increasing their ill-gotten riches and do not consider investing in the country and its people. In addition, in 2013 Russia ranked second in numbers of asylum seekers , surpassing Afghanistan and exceeded only by Syria, which is in a full-blown civil war. What’s worse, Russia is losing its best people. Real white Russians — and anyone who continues to possess at least a speck of white European identity — are running away. Add these wretched conditions to Western-style decadence and you get a very gloomy picture. George Bernard Shaw once claimed that America was the first society to go from barbarism to decadence  without passing through civilization. Russia, unfortunately, has gone from Soviet barbarism to Western decadence, with only the most superficial revivals of traditional civilization. As the ominous processes erasing white Western man and his civilization proceed without interruption, European nationalists feel themselves in Zeitnot. Time is running out. This, in turn, compels them to make short-sighted decisions, try quick-fix solutions, and pray of apocalyptic transformations or a savior on a white horse. But the height of silliness is the cult of Vladimir Putin among Western ethnonationalists, which recently has been accompanied by the outright betrayal of their real ideological and racial allies. Part of this is caused by a lack of thorough, far-sighted analysis — part of it by simple ignorance about Muscovy-Russia. As should already be obvious from everything written above, Russia does not, and simply cannot, have anything to offer as spiritual guidance to Europeans. Dugin’s Eurasianism, moreover, has nothing to offer ethnonationalists. It is merely a vapid contrivance  in support of Russian imperial revanchism, with all its ethnocidal consequences for Russians as well as their intended victims. White Nationalists must finally come to grips with the fact that the national interests of Russians are not only not the same as, but, in many cases, are actually in conflict with those of Europeans. Therefore, they should not expect Russians to feel empathy with their struggle. In fact, the majority of Russians do not even think they share common enemies with Europeans. Surprising as it may seem to many White Nationalists, Muscovite-Russians see European civilization itself as their main enemy, and it is this confrontation and animosity that underline their identity and their vision of their civilizational destiny. A highly pertinent historical analogy can be drawn from Oswald Spengler. The Eastern parts of Roman Empire, which were populated mostly by Syriac and Aramaic speaking peoples, experienced Classical Civilization as an alien imposition, an inappropriate cultural form that thwarted the fulfillment of their own unique destiny. Thus the Near-Eastern subjects of the Empire held a subconscious and deep-seated hatred against everything Roman. Spengler claimed that an analogous “pseudomorphosis” took place in Russia after Peter the Great forcefully brought it under the influence of European Culture. When most Westerners think of Russia, they think of the glories of Russian culture, especially in literature and music, from the 18th and 19th centuries. But that culture was an artificial top-down creation, superimposed by Peter the Great and his successors and deeply resented by the native Russian population. In this respect, the Bolshevik Revolution can be regarded as the Muscovite-Russian revolt  against European Civilization, just as the advent of Islam was the revolt of Near-Eastern peoples against Classical Civilization, even though Marxism itself was a Western ideology. More importantly, there is no reason to suppose that these processes came to a halt or were somehow reversed. On the contrary, they remain in full force in contemporary Russian society. Indeed, this can explain the veneration of the Soviet past and Stalin’s increasing popularity among Russians. The current revolution in Ukraine, in which nationalists played a leading and decisive role, is a great opportunity for western White Nationalists, provided that we draw the correct conclusions and take the right steps. Unfortunately, western WNs have not yet sufficiently comprehended the meaning of the Ukrainian revolution. But it is not too late to correct the damage done by hasty and uncritical support of Vladimir Putin. Ukrainian nationalists are being accused of receiving support from the Obama administration, U.S. State Department, and E.U. Moreover, the leader of Svoboda, Oleg Tyahnybok, has been chastised for meeting with John McCain. These observations, it is alleged in WN circles, are enough to disqualify Svoboda and Right Sector as our friends and prove instead that they are simply the puppets of anti-white forces represented by the U.S. and E.U. In effect, such White Nationalists are allowing their enemies to tell them who their friends are. It is an essentially reactionary and unprincipled approach to politics. They despise the U.S. and E.U., so they side with Vladimir Putin, because the U.S. and E.U. have decided that he is their enemy. They side against the Ukrainian nationalists, because they are Putin’s enemies and the temporary allies of the US and EU. But a mature political movement does not let its enemies decide who its friends are. Instead, a mature movement decides for itself. It consults its own principles to determine who its friends are and who its enemies are. Carl Schmitt claims that one function of a sovereign is to decide who the enemy is. By failing to choose their enemies and friends for themselves, White Nationalists prove that they are not ready to lead a sovereign people. Instead, they are merely followers of the true lords of this world, whom they affect to despise, yet pose no threat to their continued sovereignty. By ethnonationalist standards, Svoboda and Right Sector should be our friends, because they share common principles with us. And, by ethnonationalist standards, Vladimir Putin—who seeks to preserve and expand Russia as a multiracial, multicultural empire—is just as much our enemy as the US and the EU. Putin sees this far more clearly than his Western White Nationalist supporters, since he jails their Russian equivalents. It is irrelevant whom Obama and the E.U. support. What is important is that we support people who share our own principles. It may very well be that in Ukraine our enemies, either unknowingly or more likely knowingly but unwillingly, support our true friends and allies. The fact that in Ukraine the enemies of the white race found it expedient and in line with their perceived interests to support (most likely temporarily) Ukrainian nationalists does not qualify the latter as someone to be shunned by White Nationalists. If we really believe our principles, then we should think better of the West for supporting Svoboda and Right Sector, not worse of the Ukrainian nationalists. 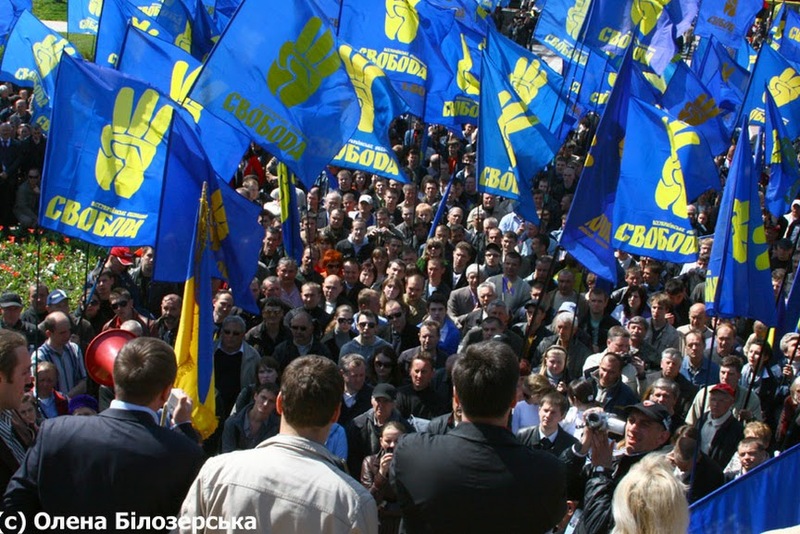 The fact that in Ukraine nationalists were part of a large political coalition and actually the main force behind its victory can lend credence to other nationalist movements all over Europe. It has the potential to improve the reputation of nationalist movements, and more importantly the reputation of nationalism as an idea, in the eyes of white Europeans. Therefore, the support received by the Right Sector and Svoboda from the U.S. and E.U. could play into our hands and thus should be viewed as an opportunity. Of course, anti-white forces supported nationalists in Ukraine in order to pursue their own goals and to strengthen their position in Europe against Russia. But that is irrelevant to us. What is solely important is that nationalists acted as the main engine of an uprising viewed mostly favorably in the eyes of the western public and were given, at least for now, relatively favorable coverage in the western media (something that other nationalist parties in Europe cannot yet even dream of). Instead of fawning over Russia and trying to court favors from Putin, Western White Nationalists should develop closer contacts with Svoboda and the Right Sector, learn from their experience, and begin applying and improving the methods which brought them success. In Western Europe, various European nationalist groups have been motivated to set aside petty nationalism and recognize pan-European interests. Their external motive is the threat of American hegemony. (Most Americans may be white, but the American ideology and system are anti-white and imperialistic. Thus we must love the sinners but hate their sins.) Their internal motive is the social upheaval caused by mass non-white immigration. Both of these threats harm Europeans as Europeans, causing them to think as Europeans, with a common heritage, a common identity, common interests, and a common destiny. A similar process is taking place in Eastern Europe. From the Baltic to the Black Sea, there are vivid memories of Russian and Soviet oppression. “Russophobia” is not an irrational fear, as this politically correct accusation implies. It is entirely rational, given past history and current events. Again, as in America, there are many whites in Russia, but they too are in the grip of an ethnocidal and imperialistic ideology, which is destructive to their own real identity as well as that of their neighbors. We love the sinners but deplore their sins. The renewed danger emanating from Russia is bringing Eastern European countries closer together. White Nationalists hope that a common danger will help them forget their past grievances against each other. For instance, Poland and Lithuania openly expressed their support for Ukraine from the very beginning. Recently, strong moves have also been taken for a rapprochement  of Ukraine with Romania and Hungary. Furthermore, just as Western Europeans feel threatened by Third World populations within their borders, Eastern Europeans feel threatened by restive Russian populations within their borders, which present the same threat to their identity as blacks, Arabs, Turks, and South Asians present to Western Europe. Western White Nationalists need to recognize that the Ukrainian struggle for national self-determination is our struggle too.